Open up Stone_Source01.tga that you saved from PART 2. 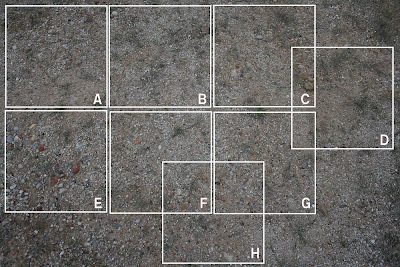 We now need to select 8 different areas of this image and make 8 different textures. 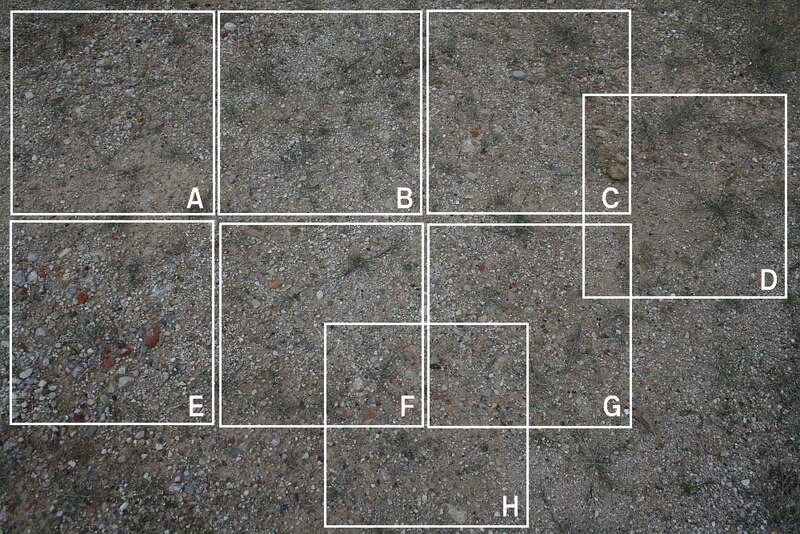 You can pick any areas you think are suitable, Below is how I picked. We need that image to be 256/256 exactly so type in 256 in the selection box in the lower part of the toolbox. This will need to be done 8 times from the source image. For each one click Edit/Copy from the top tool bar, then click on File/new on top tool bar. Click on File/Save as and type in Sm_Stones01_A Click on the flatten layers and click save. Do this for all 8 textures, name each one as described in Part 1. Once all of that is done close all the images down and open up the REd, Green, Blue and Yellow textures. 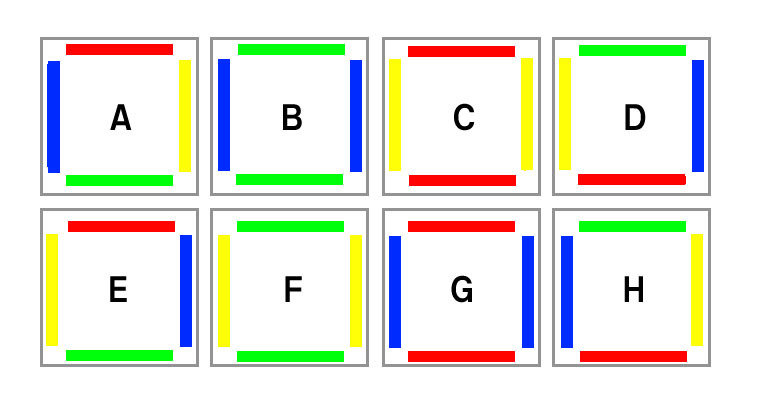 As seen in this image, we need red at the top, green at the bottom, blue on the left and yellow on the right. Follow the above steps for the yellow/Green and blue layers, each time make sure you are happy with the result, you can always delete a layer and redo if not happy. 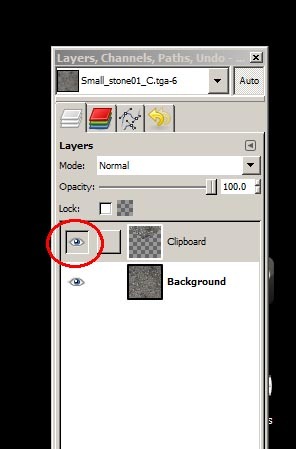 To merge the layers, click on Layer/Merge down on the top tool bar, do this for all layers. On Sm_Stone_A top tool bar click on Edit/Copy, then Edit paste as/New layer, then click on Layer/Mask/Add Layer Mask on top tool bar. 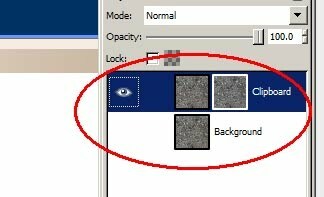 In the new pop up window click on Grayscale copy of layer, then click Add. and leave just your new layer with a grayscale version which will get saved as your alpha channel. Repeat that process for each of your 8 textures, making sure you match the edges to the image seen here you will have a set of textures ready to be converted into Ace files, Well done! First time round the process takes awhile, however after a few atempts it should take about 15 minutes per texture set. 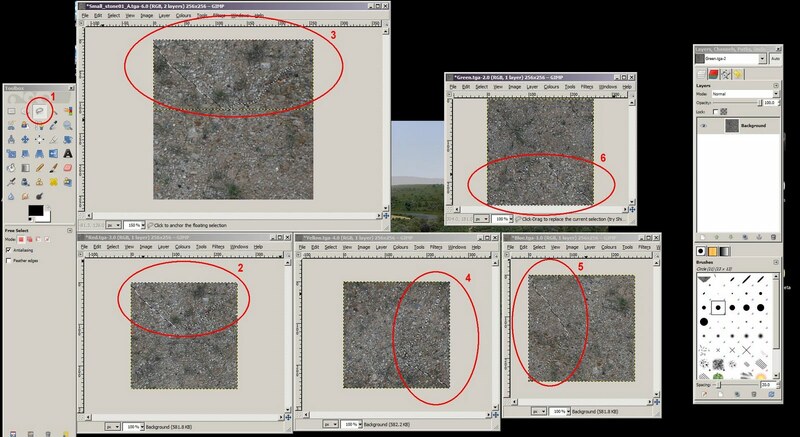 Next in Part 4: Coverting to Ace using Ben Laws Ace tool and setting up Terrain XML.